Leila McAlister & I took a day trip yesterday, driving in her van down to the Kent Marshes to visit James Worley at Oakleigh Farm who grows the asparagus that she sells in her shop. Positioned under a wide estuarine sky, upon three hundred acres of low-lying land between Higham and Cooling where the farmland meets the marshland, James’ father began farming here thirty years ago. 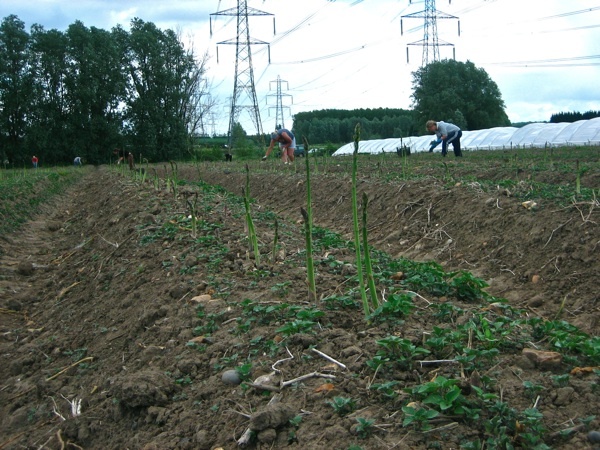 Yet even James’ single acre of asparagus constitutes a gamble, at a cost of ten thousand pounds for the plants and a three year wait for the first crop from his planting of asparagus heads, that will have a life of no more than nine years. We found the field of asparagus at the furthest extent of the farm, upon a gentle incline next to tall stand of willows beside the railway line, beyond which there is just meadow and marsh given over to wildlife. It was a sight of wonder – the bare earth of the field punctuated in surreal fashion by the sharp green spears of asparagus, like those spear heads of a buried army emerging from the earth in mythology. “We knew they would do well here because they grow wild, seeding themselves in the fruit orchards,” James explained brightly, surveying his proud experiment which constitutes a step towards a new direction for Oakleigh Farm. 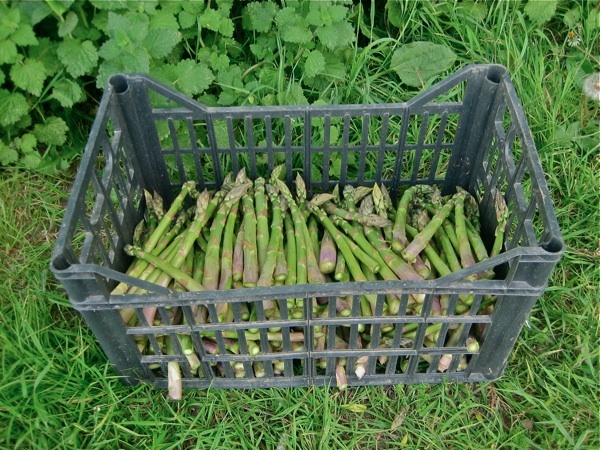 This is the third year and we were looking upon his first significant harvest of asparagus. From March, the force of these tender stems cracks the hard soil apart and pushes great clods of dried earth aside, as the first green shoots of the year, even before the weeds appear. James has polythene tunnels to warm the soil and bring his crop forward, a redundant measure in this year’s exceptionally mild Spring. 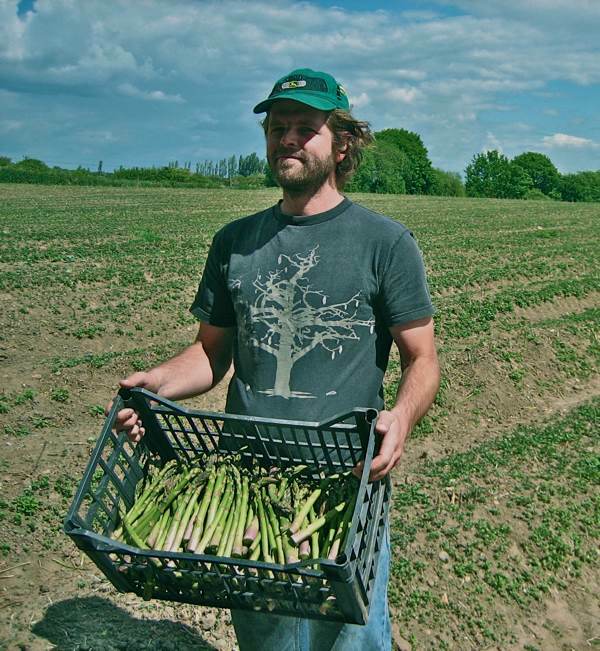 Given the sustained warm weather and the lack of rain, the question upon James’ mind is whether the harvest will last until the longest day, traditionally the end of the English asparagus season. The extraordinary rapid growth of these shoots means that picking must continue seven days a week. They grow a couple of inches each day, and in three days a stem can come from the soil to reach harvestable size – and in four days they are over and flowering. 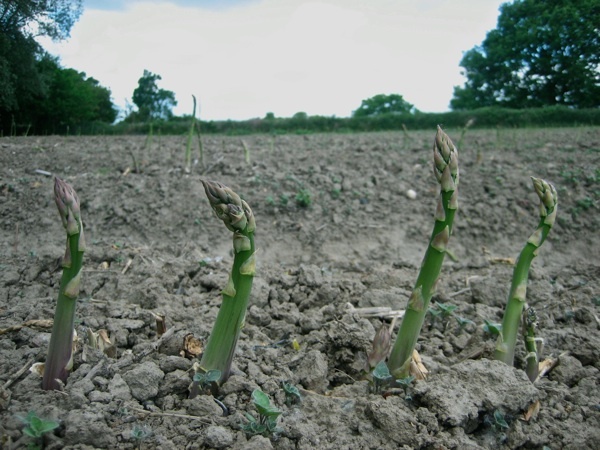 Weather conditions can have a radical affect upon growth, with a sudden change in temperature or strong winds resulting in mis-shapen wind-blown spears of asparagus. 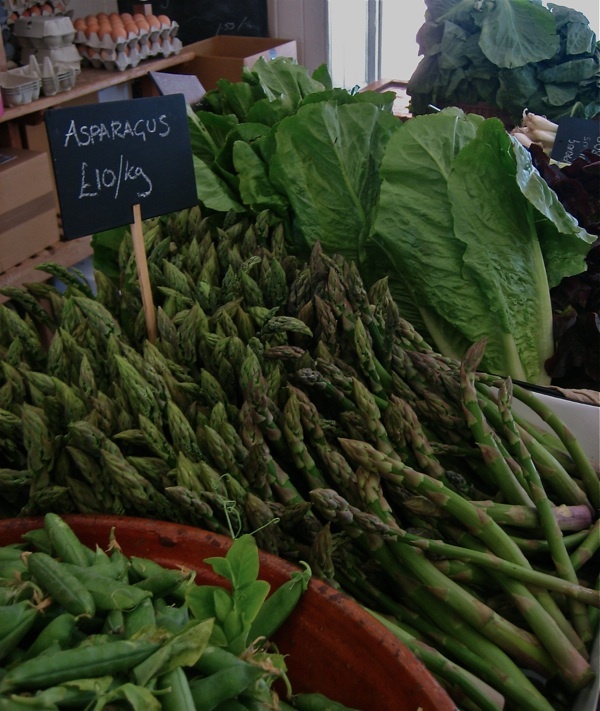 “I could happily eat asparagus every day and live off it – I would!” admitted Leila, who supplies Oakleigh Farm asparagus to the Rochelle Canteen, Towpath Cafe and Violet Cakes as well as selling it in her shop. The resonant snap of the stem as it is cut, that I heard in the field that day, is a sound to gladden the heart of any asparagus lover, and regular deliveries from Kent to Calvert Avenue permit East Enders to buy it as fresh as it can be had while it is in season. When asparagus is this good, Leila recommends eating it as it is, though – when pushed – she also suggested serving it with Farro grain, chopped cucumber and fresh herbs. 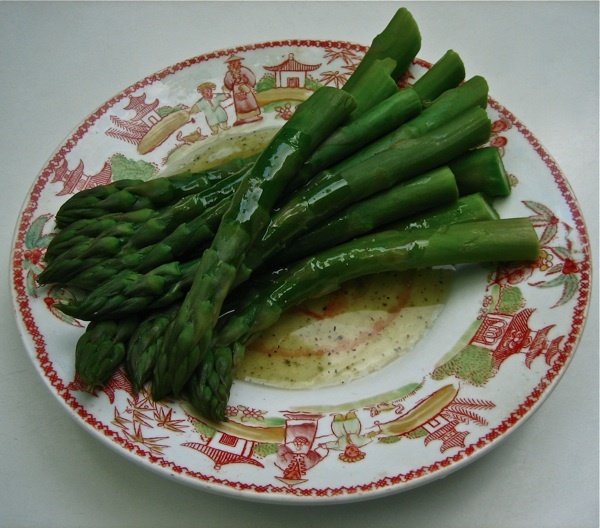 I could not wait to get home with my brown paper packet of asparagus spears, slice off the ends and steam them for a couple of minutes while mixing a lemon juice and olive oil dressing, before carrying the dish down to the garden in the cool of the evening. I sat alone devouring the stack of delicious green stems – with a satisfying texture that is crisp to the first bite and then soft upon the tongue - one after the other, in a kind of trance. I thought about our sunlit drive through the winding lanes across the Kent marshes between hedges lined with cow parsley and dog roses, and punctuated by old clapperboard houses. I thought about getting lost on the way to Oakleigh Farm and ending up by accident at the church that Dickens put in Great Expectations. I recalled standing in the asparagus field listening to the chorus of frogs booming from the marshes. I could still feel the flush of wind and sun upon my face. And all of these impressions were to be savoured, contained in the experience of eating James Worley’s asparagus from Leila’s Shop. Leila’s weekly vegetable boxes are available for delivery throughout Shoreditch, Dalston, London Fields, Bethnal Green, Spitalfields and Whitechapel. You can find the vegetable box blog by clicking here. Estuarine–nice use of an obscure adjective! Cooling is fantastic – especially the graves associated with Great Expectations. And the coastline and Egypt Bay are well worth the trek for the able bodied. After reading this post I think I might have to take a walk to Leila’s and buy some at lunch time now! love the process story of the pix. farro, chopped cucumber and herbs, yum. I’m not even a huge fan of asparagus, but I wanted to be after reading this post. or maybe I really wanted to get lost with the two of you in winding country lanes, and then stand listening to a chorus of frogs from the marshes. I hope the next time I taste asparagus, that is the image that will linger. Lovely article, thanks! Growing up in urban areas, I never knew how asparagus was grown. Wonderful pictures – it’s fascinating to see the shoots bursting through the soil like that! The veggies we buy at the supermarket are never as good as anything freshly picked. Wish I could shop at Leila’s!